My story is simple. No deceivers or betrayers, no friends to guide me on my way. I guess the ocean is like that – genuine. Which is why I needed to leave my home and find peace somewhere far out at sea. I didn’t live in the world I thought I did and I didn’t belong in it, so I ran away seeking friendship only from the sea. I walked down the lane to the bay slowly, taking in my last moments as a regular child. I stepped aboard my father’s ship. I could smell the food, which would last me only a few weeks, but had taken me months to gather. I felt ready for anything, so I set sail. I didn’t know where I was going, and very soon all I could see was ocean in every direction. I let the sea carry me away for a few days, maybe weeks. To be honest, I hadn’t a clue. And soon the obvious became clear; I was stuck in the middle of nowhere without water. I found an empty flask in a first aid kit. I kept bringing it to my lips and swallowing as if I was actually drinking, but I wasn’t. Would my punishment for this mistake be death? Would I regret this for the rest of my life, or at least what was left of it? I constantly repeated a line from a poem we learned at school. It seemed both depressing and appropriate, “water, water everywhere, but not a drop to drink.” We also learned at school that dehydration can cause powerful hallucinations. Maybe I was going mad. I started to feel dizzy and heavy on my feet. I sat down. I needed to focus, to come up with a plan, but first priority was survival. I looked to the never-ending sea for some kind of comfort. Then I saw a…What was that? I thought it was a bottle floating towards the boat. A bottle? Bottles hold liquids like wine, but I knew this one held water. Pure, clear water – just the thought of it made me frantic. I wanted nothing more in that moment than to leap into the sea, retrieve the bottle, and taste the water inside. So I did. However, the bottle was filled with seawater. It didn’t even have a lid. I felt defeated. I was tired and hopeless. I stopped swimming and just rested on the waves. I began to sink, but I didn’t fight to stay afloat. I let myself go. I closed my eyes. If I was going to die, I thought I may as well do it there, right then, peacefully, within my favourite place on earth – the sea. I was happy, but my bliss was interrupted by a bump. My head had hit something. If I wasn’t in the sea I would have been sure I had bumped into a wall. It felt like one. I opened my eyes and looked up and sure enough, I had bumped into a wall – a wall of a great building, an underwater building. Now I was definitely losing it. I looked around and saw an entire village of house-like buildings, and the sea turned from a deep, dying blue to a collage of colour: vibrant, sunlit yellows, dark, rich forest greens, shimmering, sleek silvers, life-affirming reds and an impossible, endless blue surrounding it all. Shoals of fish came in every direction. Either that, or they’d been there all along and I hadn’t noticed. 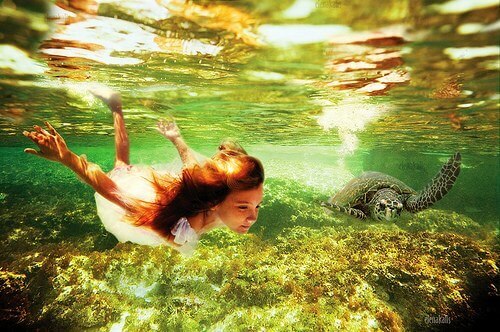 I swam around, mystified by the beauty all around me. Very soon I forgot that I needed to go up for air, so I didn’t. I forgot I was thirsty, and I wasn’t. All I knew was I never wanted to leave that amazing place, so I didn’t. How could I? Darkness fell, and then everything sank into a dark blue. I was home. Anja Drayton is a thirteen-year-old aspiring author. She enjoys creating stories, poetry, and artwork – particularly collages. She was born in Baltimore and moved to Ireland when she was four. She is currently living in Australia with her mother and her six-month-old twin brother and sister. She does a lot of international traveling, however she much prefers to stay at home, writing stories in her back garden.